were the catalyst that pushed me, wallet in tow, off the cliff so to speak. In the 400 days or so following my rebirth into the world of cardboard & combos, I've now logged 1,000 plays. If you had told me 2 years ago that I would have played an average of 2-1/2 board games a day over the course of a year, I'd have laughed at you, and probably punched your dog. Here are a few thoughts, stats, and musings from a new gamer. The first game I ever logged a play of. Friends came over and we played Monopoly Deal, Apples to Apples, and then this hit the table. I enjoyed it at the time, though it went on for about four hours. Not really my cup of tea anymore, but I'd play with the owner of this game (my cousin) in a heartbeat, as he's always a riot to play with. The first "gamers' game" I ever thrifted. I've been heavily involved in the thrifting community since I first joined, and when I saw the Wizards of the Coast logo on the box I knew I had to grab this one. We played it several times, and I ended up giving it to a friend who would cannabilize it for the bits. I'm kind of missing this one though, as a short, piratey Talisman experience can have its use from time to time. I actually just traded to reacquire this one. Thrifting has been a big part of my BGG experience, and I've made some great finds (Catan, Survive!, Carcassonne, Dark Tower, and Dune come to mind). The first gamer's game I bought brand new. I was heavily into zombies at the time, as my wife and I enjoy zombie films and both have logged hundreds of hours in Left 4 Dead. She doesn't like this one as much as I do (she says it's too random [but her favorite game is LIFE, so... ? ]), but it's still one of my favorite thematic games. I just got the Survival of the Fittest expansion in trade after wearing out the base game over nearly three dozen plays. 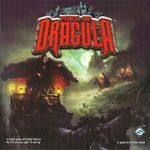 The first game I played at the FLGS. held my hand (FIGURATIVELY) throughout the ordeal, helping us to find and stake Dracula. I actually can't remember if we won, but this was a real eye-opener. Though I played with them once after this, I'm not as big a fan anymore, enjoying shorter games with a built-in timer like Scotland Yard for this kind of a fix. The first game I traded. I thrifted this one for $5, seeing on the 'Geek that it was fairly rare. I traded this to a kind BGGer who helped me figure out a good trade and was patient through my first back-and-forth negotiation. I got a few plays out of it but ultimately it was too long for my developing tastes, so I sold it for a fair amount here on the BGG Marketplace. The first game I rated a "10"
I'm careful to rate all the games I feel comfortable doing so, whether after just one play or a couple dozen. 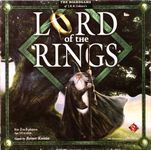 Lord of the Rings was an instant 10 in my book: tense play, cooperation, gorgeous art, great but unconventional thematic integration. This is a game with a built-in mechanic whereby a Hobbit can, in a certain situation, sacrifice himself (literally removing himself from the game!) for the quest to continue. Brilliant. Only two tens have followed so far: Band of Brothers Screaming Eagles (gradually upgraded from 8 to 10) and Acquire (another instant 10). The first game I designed. Being something of a disc golf fan, I was shocked that there aren't any disc golf games out there, on BGG or otherwise. I decided to try my hand at it. It's actually done but I have been too lazy to finalize the PDF and upload it for print n' play use, until this weekend when I went ahead and gave it the final push to make it a reality. It has been a great learning experience. The first game I reviewed. I have written professionally, most notably in the video game industry, so when I got into board games, reviewing was natural for me. 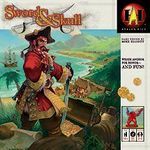 I'm definitely not the greatest at it, as other BGG reviewers are just amazing in what they can do, but I enjoy the thought process and effort into making a review readable, fun, and helpful. I've put up a total of 9 reviews so far (which surprised me, as I'd thought it would have been less). I try to review games that don't have a lot of attention, or where I have something different to add to the discussion. I gave this one a "three out of five", and I think I'd stand by that today. In fact it's right here in my travel game bag next to me, as always. The game I've played the most. This actually tied with Loopin Louie, but LL is pretty much cheating as a play lasts about 2 minutes. I absolutely love this game, and it was my first step into the wider wargaming world. The rules-to-realism ratio is fantastic, and the play is usually exciting and dynamic and down to the wire. I reviewed it, and I am developing a solo card-driven version of this on the forums (though I've been as lazy with it as with my own game). The next game on my 'buy list'. As I've learned more and more about the different genres and design styles out there, I've found myself more and more attracted to Ameritrash games where you can die or lose in hilarious ways. 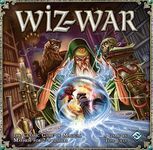 Wiz-War seems just about right for that set of criteria. I tend towards older Euros, because they seem to be more directly confrontational, simpler, shorter, and more thematic in my book. Daytona 500 blew me away, and I enjoy it more and more with each play. Possibly an eventual ten, if I ever get my hands on the game to spend some more time with it. I've mentioned Last Night on Earth elsewhere, so I'll bypass it for this one. 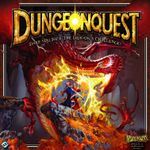 There are a few other close contenders, but it really does not get better than DungeonQuest. I think every gamer's personality can be tested by seeing how he or she reacts to a Swinging Blade death trap. My reaction is laughter, especially when it's someone else who draws it. Sure, it's a conventional pick. But simple rules that lead to complex strategy and tough decisions are what great games are made of, and no one does it better than this dude. A parody of "Thrift Shop", written for game thrifters. Enjoyed writing this one and I'm glad some people found it entertaining. It's been a fun journey so far, and this was the thousandth game I played. It's especially meaningful because one of the youth at our church is moving across the country, and all he requested as a good-bye party was to play Snake Oil all night. We are going to miss him, but we're glad we got to impact his life for a short while. Here's to a thousand more plays for all of us. Except Tiny Tim, he's a jerk.